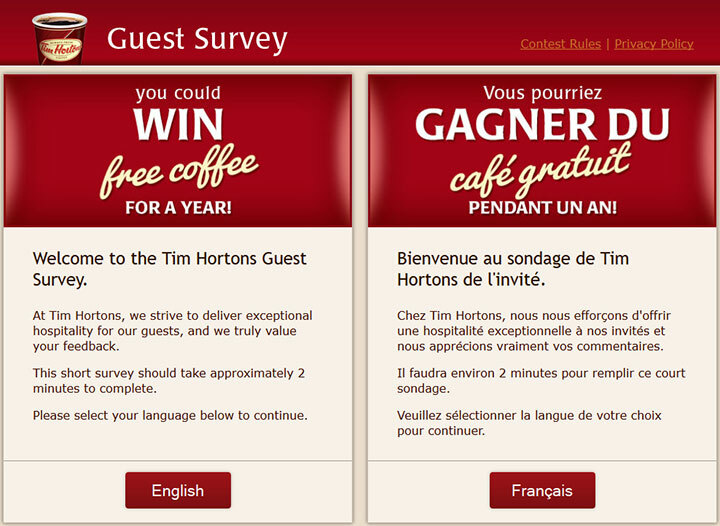 The Tim Hortons Guest Survey, found at www.TellTimhortons.com, is an online questionnaire designed by Tim Hortons that assesses consumer approval of goods and services rendered. The company takes these surveys and makes improvements based on what consumers mention they had problems with. This survey is done online for your convenience. If you choose to take the survey, you can leave feedback about your experience. It can be important to give voice to your concerns, problems and praise; it will allow you to feel better. The company enjoys receiving the feedback as well, even the bad feedback. It is important to them to continue improving their stores, and it is difficult to do this if no one tells them there are problems. To thank you for your time, Tim Hortons is allowing you to enter a sweepstakes where you could win “Free Coffee for a Year”. Sweepstakes entry is not required to leave feedback. Tim Hortons is a chain of quick service restaurants specializing in coffee and donuts but offering much more. Locations can be found all across Canada as well as in some areas of the United States and locations around the world. In 2014, the popular chain was bought by Burger King. Tim Hortons started in 1964 in Canada and over the years it expanded until it was the largest quick service restaurant chain in Canada. Even though it is owned by an American company now, it is still considered one of the quintessential Canadian icons. Many vocabulary terms have been coined for ordering in Tim Hortons such as a double-double. Click the large Next button to start. Enter the restaurant number in the text box to the left; if you cannot find this number from your receipt, enter the state/Province from the drop down list and then type in the city and address. Answer questions regarding your experience. Please follow directions carefully on each page and be honest with your answers. Enter the sweepstakes. Fill out the form with your contact information. Follow directions and make sure the form is filled out completely. Close the browser window.